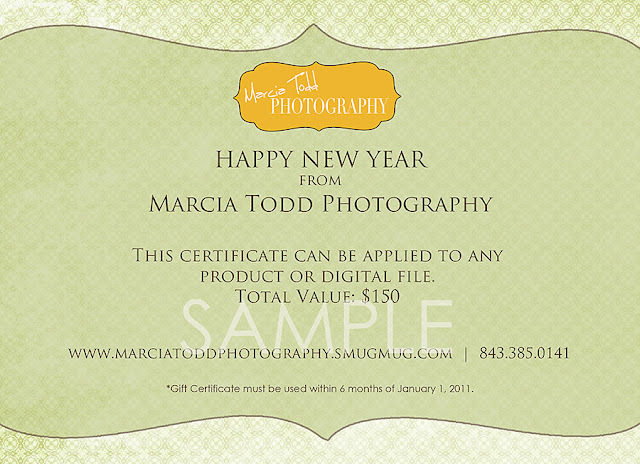 MARCIA TODD PHOTOGRAPHY: New Year Give-Aways from Marcia Todd Photography! Let's ring in the New Year with some Give-Aways because I love paying it forward! 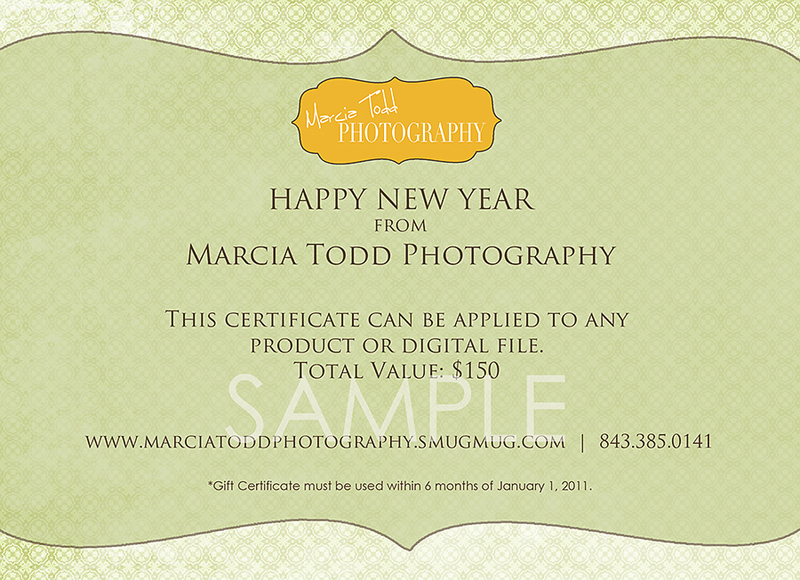 **Gift certificates are redeemable for any product or digital file, but are not valid toward session fees. 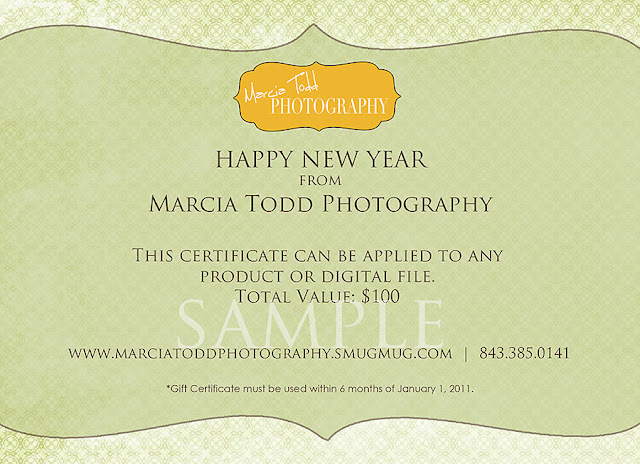 Winners will be announced January 3, 2011 between 9-11pm. I will use Random.org and use your post numbers to choose the winners. Comments on this entry will be numbered in order of posting. The winners will be contacted within 24 hours of contest's end to claim their prize. UPDATE: You must post the link to this blog on your facebook, twitter, etc. then come back to this blog and comment here that you’ve done so with the link to your facebook wall. – each entry requires its own separate comment. ATTENTION: I cannot notify you if you are a winner if (1) I don't have a link to your facebook, twitter, etc. (2) you leave a comment as "ANONYMOUS" Please leave a comment below by using your Google account or "Name/URL"
If you do not follow the directions correctly – your entry will automatically be disqualified. You can enter / post up to 4x......You can enter/post up to 4x......You can enter/post up to 4x!! Stay Healthy and stay in touch with great friends! My New Year's Resolution is to bring someone to Christ. My new years resolution is to slow down in this busy life and enjoy all the small moments for those are the ones that mean the most. My new years resolution is to spend quality time with my family daily! My new years resolution is to spend more time with family and friends and get HEALTHY!!! I don't really make New Years Resolutions. I believe every day is a chance to start new, whatever that may be. For me, I want to wake up every morning and ask God, "what do you want me to do today?" AND THEN DO IT! My New's Year's resolution is to say No more often to things that don't matter as much so that I can say Yes to the things that do!!!! My news years resolution is to become more organized and to have the best year that I can possibly dream of. My New Year's Resolution is to make 2011 mine! My New Year's ressolution is to make many wonderful memories wirh my son and husband! My New Year's Resolution is to exercise more! My resolution is to make this a WONDERFUL year for me and my family with a new Career and a NEW ME!! My goal for 2011 is to run a half marathon. My goal for 2011 is to show the love of Christ everyday & to be the best wife, daughter, step-momma & friend I can be! My goal for 2011 is to make it a happy, memorable year for my expanding family and to also stay in closer communication with friends and family that do not live near me. My goal for 2011 is to give as much as I can everyday to my family, friends, work and commitments. To GOD be the glory, I am so thankful for everything He has given me and I plan to do my best to show it to Him and appreciate them! My new year's resolution is to enjoy the little things in life - don't sweat the small stuff! My resolution is to win!!!! 2011 is going to be a great year! May God bless us all. My resolution is to remain thankful for all I have been given and for what is yet to come! To no longer be a doormat at work, to exercise, to enjoy by little boy that is growing up way to fast, and to go on a real vacation! To enjoy everyday to the fullest! To enjoy being a mother and all the little things along the way! WOW where do I begin..to enjoy my autistic son Lawson,to teach him he can do anything in life if he tries and to always be there for my daughter who is in treatment now,that nothing will over power her again except her HIGHER POWER! !GOD you are sooo AWESOME and I THANK YOU for EVERYTHING!HAPPY to say GOODBYE 2010 an HELLO 2011!! To SLOW DOWN, and not stress about the small stuff. And to read the Bible front to back. I have no idea if I did the URL right. My resolutions are to be more patient, to hug my family more and to not sweat the small stuff! My New Year's resolution is to be more organized in every spect of my life. My New Year's Resolution is to continue on my fitness path...only 8 lbs to go to reach my goal! for my family and enjoy the years I have with my lil man before he is all grown up! My goal for 2011 is to make it the best I ever had!! Posted to my twitter account, my personal facebook and my business facebook!! I enjoy photography myself and i'm always the one taking the pictures, it would be nice to win so I could be the one in the pictures this time. You do amazing work Marcia. My resoultions are to no longer be a doormat at work, execrcise more, enjoy my little boy that is growing up way to fast, and go on a real vacation! And another one that I forgot from yesterday- to get serious about clipping my coupons again... It's like throwing away free money! My New Year's Resolution is to be a better Christian! My New Year's Resolution is to be the best at my job as I can be! Another resolution is to be the best Mommy and wife I can be! My New Year's resolution is to TRUST totally in GOD for He is where all my answers lie!! My NY resolution is to be more healthy! My New Year's resolution is to lose the remaining 10 lbs of baby weight and be a better mother, sister, wife, friend and co worker this year! My New Year's resolution is to show more GRACE to others! I really would LOVE to win!! My new year's resolution is on December 31, 2011 to look back and smile! Have a great time making lasting memories with my three year old! I have a few NY resolutions....1. Become closer to God 2. Real Estate License 3. Take a 1SG position 4. License to practive M&F Therapy. 5. Learn Krav Maga just to name a few lolololol. I would to use this gift cert. when I am home Jan. 21. To capture more moments with my sister using Marcia's talented eyes. To give more to the needy. To use this during my trip home Jan. 21 to use to decorate the walls in my new future house. My goal is to continue walking 4-5 miles a day 5-7 days a week like I've been doing since Sept.
For 2011 .... I must remember I am who I am and I only have ONE life to experience EVERYTHING! To complete the Charleston Bridge Run... no walking. My New Year's Resolution is to become better organized and to be clutter free! My goal for this year is to keep my sugar under control and live each day to it's fullest with God's help. My New Year's Resolution is to be a Great Wife, Wonderful Mother, and give birth to another healthy beautiful baby!! To remain healthy, happy, and live life to the fullest! My New Year's Resolution is to do my best in school and spend as much time as possible with my baby girl! My resolution this year is to remember what is most important in life, to take deep breaths and know that this too shall pass. Have fun with my Family! I would also like to add that all you that want to be Healthier or Just flat out have a Hot Body this year... well you can contact me! I got something for that!! In 2011 I am going to have a family portrait taken! My New Years Resolution is too study harder at school so I will be 1 step closer to my nursing degree! My New Years Resolution is not to stress the small stuff in life! Resolution is to be a better and more patient mom. AND in 2011 after having a family portrait taken, I am gonna have it hanging on the walls!! And to enjoy each MOMENT, the "little things" are what make life memorable! http://www.facebook.com/#!/profile.php?id=510731294 Amy Richardson. My new years resolution is to make sure my baby gets as much time with her mommy as possible! Ok, so another resolution is to win this dang contest!!!! http://www.facebook.com/profile.php?id=510731294#!/profile.php?id=510731294 Another one is to put GOD first in our family! We are so excited about what He has in store for us! To be a better husband and father. My new years resolution is to be in every moment that is made with my family and be less worried about making sure things are organized and perfect! Drink 4 more glasses of water each day and win more contests! My New Year's Resolution is to get in shape! New Years Resolution for 2011: Take more pictures :) Be more positive! Get in better shape!! http://www.facebook.com/#!/profile.php?id=510731294 Resolution #3 LOSE WEIGHT so i actually look good in my photo session! For the New Year I want to just stay the same! My goal for 2011 is to SLOW DOWN and enjoy every minute at home with my family! Great idea!! My resolution is to get in shape so I'll look hot in my photo shoot!! Reposting with the url correctly listed... Sorry! New Years Resolution for 2011: Be more positive! Another thing (for 2013) is that I would love to loose a few thousand pounds or at least a couple of inches would be a GOOD start. Get involved in 1 church & serve. Learn how to cook things other than lasagna and brownies from a box. My New Year's Resolution is to be the best Gymnast I can be this season! My New Year's Resolution is to more organized and make better use of all my time! My New Years Resolution is to eat healthier and excercise more. Another resolution, to be on time for appointments!!! No matter how hard I try....jeeezzzz! Get it together! To accept that God has a plan for my family and to remember that whatever trials we may go through God will never let us go. Through everything I want to stay positive. I am feeling lucky 2011! I hope to be the best Daddy and Husband this 2011! To be healthier and exercise more. To be a better mother, wife and lose weight in hopes of becoming healthier. In 2011 I plan to slow down and enjoy the simple things in life. My new years resolution is to slow down and enjoy my family. To draw closer to God and allow him to use me for his kingdom work! To make healthier choices including food, activities, etc and to set this as an example for my little ones! Be a better wife and mother! Win this portrait session for my wife! Make Dylan and Ashley smile everyday! In 2011 my resolution is to be the best mommy and wife I can be! To take more pictures of my children and enjoy each and every moment of their lives. My resolution is to win this contest. WIN this for my wife! OK, really...I need to win this for my wife. To be healthier (eat better and exercise) and to read the bible all the way through!! To exercise more, get healthier, love my family more and become closer to God! To enjoy friends and family more!!! To let Jesus lead my life.